Three people check in at a hotel, the clerk says the bill is 30 gold pieces. Each guest pays 10 pieces each. Later the clerk realizes a mistake was made, the bill is only supposed to be 25 coins in total. 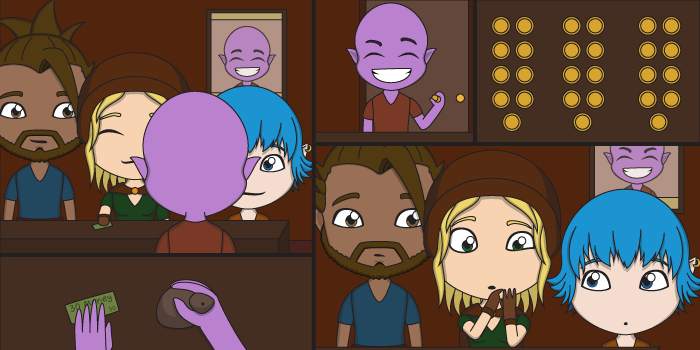 With 5 coins in his pocket, the clerk seeks out the guests, but quickly realizes you can't divide 5 coins among 3 people. So instead the clerk decides to give each guest 1 coin back, and keeps 2 coins himself as a tip. The guests don't know about the mistake anyway. So each guest, having received 1 coin back, have paid 9 coins each, which brings their total to 27. The clerk has the 2 coin tip in his hand, bringing the total to 29. What happened to the last coin? The math savvy among you will probably have noticed the answer quite quickly, but either way the answer lies within presenting the numbers correctly. The question "What happened to the last coin?" makes it seem as if the total of what the guests paid and what the clerk has in his pocket should add up to 30, but this isn't true. The 2 coins are part of what the guests paid, they each paid 9 coins and each have 1 coin in their pockets, this total adds up to 30. The total of 30 can be calculated in various ways, for example: There's 25 in the cash register, 2 coins in the clerk's pocket, and 1 coin in each of the guests' pockets. Or more simply, the hotel has 25 coins in the cash register and 5 were given to the clerk and guests collectively. This riddle offers a whole lot of fun in terms of character opportunities. A shady salesperson trying to make an extra coin through swindling (by asking the party to cover for the extra coin), a peculiar guard who will let the party pass if they can answer this riddle and uses real coins to demonstrate it (hoping he gets to keep a coin at the end as an entertainment tip), a con artist using this technique (informal fallacies) to get rich of the less intelligent, or perhaps a king who gets furious after his treasurer thinks money has gone missing by miscounting the treasury this way. How far you can take the trickery will depend on your group of course. Some will see right through the riddle, others will know there's a right answer if the whole thing is presented as a riddle, and so on. But the character interactions are what makes this riddle the most fun and interesting. The riddle is fairly easy to adjust too. The biggest challenge is making sure there's only 1 coin "missing". You could make it look like more coins are missing, but then the puzzle becomes easier to solve. For example, let's say 4 guests pay 6 coins each, so 24 in total. 5 coins need to be returned, but this can't be divided by 4. So 4 coins are given back instead. Each guest paid 5 coins, totalling 20. The clerk has 1, bringing the total to 21. What happened to the other 3 coins? This one's way more obvious. - 3 guests: 3 guests x 2 -1 = 5 coins to be returned. 5 - 3 = 2 coins to the clerk. - 4 guests: 4 x 2 - 1 = 7 coins to be returned. 7 - 4 = 3 coins to the clerk. - 5 guests: 5 x 2 - 1 = 9. 9 - 5 = 4. Should you go for the riddle character or just need more riddles, try out the riddle generator on my other site, there's hundreds of riddles there.